As a fan of HGTV and DIY Network‘s many home remodeling and DIY shows, I have a bone to pick with the quality of workmanship sometimes displayed when they’re operating on a low budget or within a limited timeframe. The most glaring exhibition of amateur craftsmanship they often make is to paint over existing wallpaper. This is just wrong for so many reasons! In fact, homeowners should immediately change channels when presented with such an extremely poor example. Leaving existing wallpaper in place when painting usually means that a few months down the road — when a corner comes loose or a panel peals up — your fresh paint job will have been done for naught. No matter how nice of a paint job you try to accomplish, you will be left with the wallpaper seam lines showing. Worse yet, now that the wall is a single color with no pattern, those lines will stick out like a sore thumb. For starters, if you paint over wallpaper, then the minute you realize the mistake you’ve made and how bad it looks the paint will make your task of removing the wallpaper all that much harder. It will prevent any wallpaper removal aids from actually penetrating through the wallpaper. Painted wallpaper just screams that you don’t care about your home. It could even affect resale value, if you’re preparing your home for sale. No matter what, before you paint a wall, all of the old wallpaper must go. Sure, it’s a messy and sometimes aggravating job, but if you want professional results that will add value to your property it’s a must. Since the glue used to adhere wallpaper is water-soluble, the trick is getting moisture under the paper to allow the glue to release. 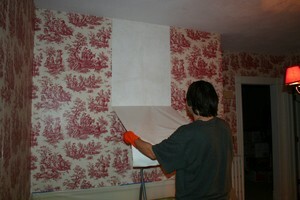 Wallpaper produced in recent decades can usually be removed successfully using a wallpaper scoring tool. This creates small holes through the paper. After scoring the wallpaper, you then apply a wallpaper stripping solution that will soak in through those perforations and release the glue. This video shows how a wallpaper scoring tool works, plus some DIY tips for creating your own wallpaper stripping solution. Fortunately, many wallpapers produced today are very easy to remove. I’ve taken down wallpaper borders that have required no more than getting a fingernail under a corner and peeling it right up. Perhaps the previous owner had a hard time getting his wallpaper to stay on the wall and resorted to using Elmer’s Glue to do the job. I admit, I’m guilty of using this trick. 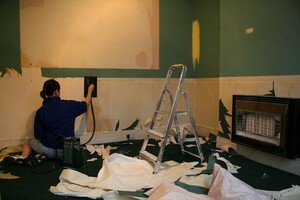 The glue is good at keeping the wallpaper on the wall, but it’s extremely difficult to remove. Check out these tips for removing Elmer’s Glue from walls. When you’re dealing with the most stubborn wallpaper situations, the only thing that’s going to get the wallpaper off the wall is good old-fashioned steam! A wallpaper steamer isn’t all that expensive to buy. Even if you only use it once, the time and effort saved removing your wallpaper will easily make the cost seem reasonable. If you’re doing an entire house, then you might want to rent a professional quality wallpaper steamer — especially since the key to your success is the quantity of steam and the size of the area that the steamer plate covers. This video shows how to use a wallpaper steamer. Sure, it’s going to take some work and probably a fair amount of patience to remove really stubborn wallpaper. Stick with it and make the effort. It’s worth it!. You’ll be rewarded for your diligence, because the end result will look just as if a professional had done the work. Whatever you do, just don’t paint over that old wallpaper!